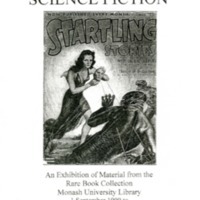 The exhibition was held in the Rare Books Exhibition space, Sir Louis Matheson Library, Monash University from 1 September 1999 - 29 February 2000. 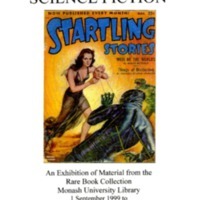 This exhibition centres on two of the less-well known areas of the Monash Rare Book Collection: a collection of American science fiction magazines from the 1920s to the 1960s, and our collection of comics. Also included are a number of eighteenth, nineteenth and twentieth century novels and journals by writers such as Jonathan Swift, Jules Verne, H. G. Wells, and even Carter Brown (under a pseudonym).